I have been a member of the Circle of Wine Writers for many years and for 18 months until January 2017 was the editor of its journal, Circle Update. My writing credits include articles for wine magazines in both the UK and the USA, such as World of Fine Wine, Decanter, Harpers Wine & Spirit. Sommelier Journal and Wine-Searcher. 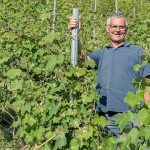 In 2017 I was shortlisted for best Online Wine Writer in the Louis Roederer International Wine Writers’ Awards for contributions to Wine-Searcher and posts on this blog. My first book, Jura Wine was published in 2014 and won the award for best wine book in the André Simon Awards 2014. 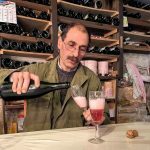 My second book, Wines of the French Alps: Savoie, Bugey and beyond will be published in 2019. “An indispensable reference not only of biggish names like Jean-Francois Ganevat but little ones, plus excellent details on geology, the region’s unique grapes … and history. A smart, perfectly timed addition to the nerd’s canon.” Jon Bonné on the book Jura Wine, October 2014. “Just wanted to thank you, Wink, for all the invaluable help you have given with our forthcoming massive book about grape varieties (Sept 2012). 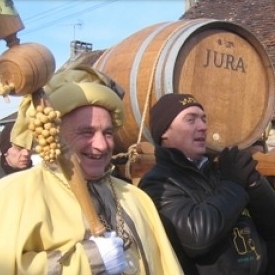 We are very lucky to have you as an informant – and I hope Jura and Savoie truly appreciate all you do for them too!” Jancis Robinson, August 2011. Wink’s chapters on Jura and Savoie that appeared in Tom Stevenson’s Wine Report 2004 – 2009 inclusive may be downloaded free of charge. 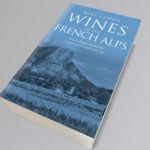 I also updated the Jura and Savoie sections of the former annual Oz Clarke’s Pocket Guide or A-Z and have helped update the Jancis Robinson/Hugh Johnson World Atlas of Wine. and of course …. on the Jura Wine Blog and the Wine Travel Guides Blog. I also write regularly for the Association of Wine Educators and Circle of Wine Writers journals. I’ve also worked for specialist wine book publishers making sure some of the best wine books in the business are in good shape, more details on my Wine Editing and Translations page.